Note: You can enter this giveaway three (3) times per e-mail address per day. Deadline is 11:59PM ET 11.30.17. If you ever wished for your own personal sous chef, wish no more. 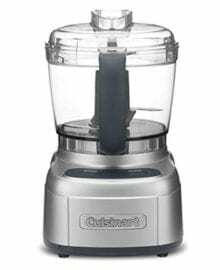 The Cuisinart chopper can handle a variety of tasks in the kitchen from chopping vegetables for Wild Rice, Roasted Chestnuts and Cranberries, grinding, and even pureeing. The SmartPower blade has a patented auto-reversing ability with a sharp edge perfect for delicate chopping and pureeing soft foods like beans for this White Bean Puree, while the blunt edge grinds through spices and harder foods with ease. The exclusive Bladelock system keeps the blade secure while processing and pouring keeping home chefs of all levels safe. Who couldn’t use a kitchen assistant like that? NO PURCHASE NECESSARY TO ENTER OR WIN. Void where prohibited by law. Open to legal residents of the 50 U.S., D.C. and Canada (excluding Quebec) who are at least eighteen years old at the time of entry and have internet access. Begins on 10.5.17 at 12:00:00 a.m. ET and ends on 11.30.17 at 11:59:59 p.m. ET. To enter the giveaway, submit your full name and email address on this form. Odds of winning this giveaway depend on the total number of eligible entries received. Only three (3) entries per email address per day. Sponsored by Leite’s Culinaria, Inc. For more information, visit our Official Rules. For a list of winners, check out our Very Happy Winners page. Be sure to add giveaways@leitesculinaria.com to ensure notification if you are the winner.